The latter part of this year looks to be an exciting time for fans of tablet computing. Apple's iPad is not going to have everything its own way for much longer, with various companies readying Android-based tablets. ViewSonic wants some of the action and its ViewPad 7, due to be shown at the IFA event in Berlin over the next few days, looks more than a little attractive. 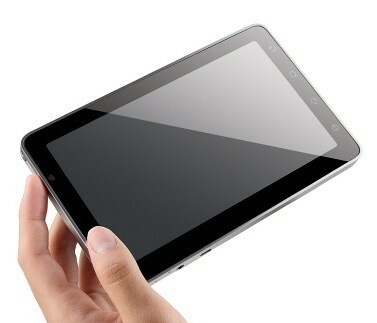 The ViewPad 7 will, as its name suggests, sport a 7in. screen. It will run Android 2.2 (Froyo) and will have phone functionality plus a 3G data connection. Wi-Fi is in the mix too. You'll be able to make voice calls, do IM, SMS and VoIP too. It remains to be seen how ergonomic voice calling will be, but its mere presence is one in the eye for Apple. Oh, and the SIM is a full-sized one, so presumably you can swap out your mobile's SIM and use that rather than having to obtain a second. The ViewPad 7 also has cameras at the front (VGA) and back (3 megapixel), a G sensor, and a microSD card slot for external storage. USB connectivity is built in, and A-GPS capability is here too. The must-have facility of an e-book reader also makes an appearance. The screen will be capacitive and so, like the iPad, ought to support pinch-to-zoom. Interestingly Viewsonic says handwritten note taking will also be supported. We wonder if that might mean there is provision for stylus-driven input, or if it simply means writing onto the screen with a fingertip. We'll have to wait and see. Price? ViewSonic is not being definite, but expects the ViewPad 7 will come in under £350 (inc. VAT) when it becomes available. There's no word on when that will be, but we expect it to be some time after the start of October.